Whatever the conditions - snow, sleet, rain, dirt, sun, or even birds - a Rain-X Car Cover will keep your car looking its best. Made from soft water-resistant, breathable fabrics, Rain-X Car Covers won't scratch your paint. And, because they are breathable, moisture can evaporate rather than collect on the surface of your car, protecting your vehicle's finish. Protects vehicle surface from the environment. Soft, durable material wont scratch vehicle surface.. Attached five way vehicle tie down straps keep cover in place. Clear away snow without leaving scratches with the new Garant snow brush! This scratch-free snow brush has a EVA foam head, a technology that is much gentler on the body of your car. Its oval aluminum handle and its insulated comfort foam provides you with better grip and optimal ergonomics. Equipped also with an ultra-robust polycarbonate scraper, this tool is a "must have" in your car. These Go On Seasonal Tire Covers are a perfect storage solution for either winter or summer tires. Designed with durable vinyl with corded edges and elastic closure for a snug fit. Features handles that make is easy to lift and carry. Less mess and hassle-free. Rain-X Ultra Car Cover, Size L Whatever the conditions - snow, sleet, rain, dirt, sun, or even birds - a Rain-X Car Cover will keep your car looking its best. Made from soft water-resistant, breathable fabrics, Rain-X Car Covers won't scratch your paint. And, because they are breathable, moisture can evaporate rather than collect on the surface of your car, protecting your vehicle's finish. 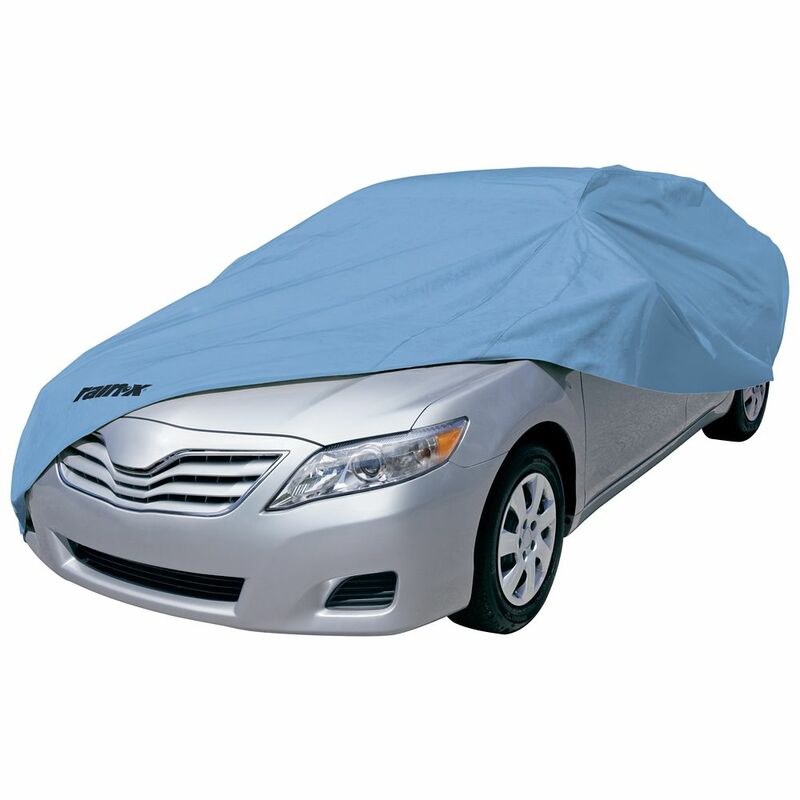 Rain-X Ultra Car Cover, Size L is rated 1.0 out of 5 by 1. Rated 1 out of 5 by HomeDepotCustomer from Poor product with a worthless warranty My Rain-X cover is 3 years old and is falling apart. The cover started leaving blue lint/fuzz on my clean car about 18 months after I started using it. The material is now so thin you can see through it in spots. I can't believe they claim it is UV resistant! Rain-X car cover is the worse warranty ever! I have tried several times to contact Rain-X to make a warranty claim but the contact information is useless. I tried e-mail and they are ignoring my requests.